M&T Plant Hire Limited is in the business of emptying and cleaning septic tanks and treatment systems. M&T’s ‘New state of the art Composting Facility’ allows the business to recycle the waste it collects, to produce a high quality fertilizer which is nutritionally beneficial as a soil amendment. Composting is a process that needs to be carefully managed so there- fore employees of M&T have received qualifications in IT Sligo HETAC which is an accredited compost operation course that is run by Cre (Composting Association of Ireland). Composting can be defined as “The natural breakdown of biodegradable materials through mixing, self-generated heating and aeration to form a stable, soil- like material”. 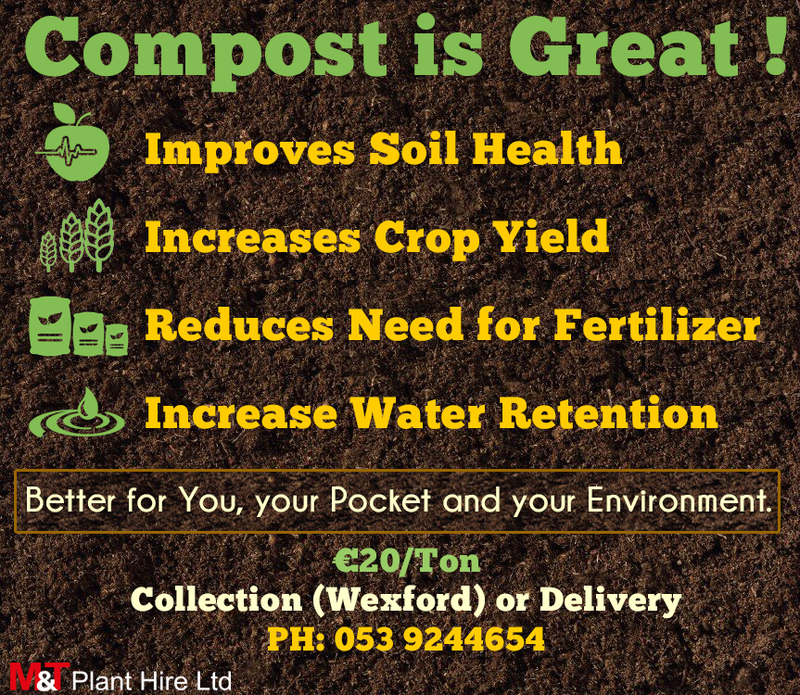 Compost is a natural, nutritional and environmentally friendly safe product to consider. • Increases organic matter in the soil which improves maximum yield potential. • Offers slow release of major crop nutrients including phosphate, magnesium and sulphur. • Improves soil structure for better workability which helps plants to have a better root development. • Increases water infiltration and retention. • Increases microbial activity, giving the soil a real fertility boost which reduces the need for additional fertilisers.